Scientists reported today (Oct. 16, 2017) the first simultaneous detection of both gravitational waves and light — an astounding collision of two neutron stars. The discovery was made nearly simultaneously by three gravitational-wave detectors, followed by observations by some 70 ground- and space-based light observatories. Neutron stars are the smallest, densest stars known to exist and are formed when massive stars explode in supernovas. As these neutron stars spiraled together, they emitted gravitational waves that were detectable for about 100 seconds. When they collided, a flash of light in the form of gamma rays was emitted and seen on Earth about two seconds after the gravitational waves. In the days and weeks following the smashup, other forms of light, or electromagnetic radiation — including X-ray, ultraviolet, optical, infrared, and radio waves — were detected. The stars were estimated to be in a range from around 1.1 to 1.6 times the mass of the sun, in the mass range of neutron stars. A neutron star is about 20 kilometers, or 12 miles, in diameter and is so dense that a teaspoon of neutron star material has a mass of about a billion tons. The initial gamma-ray measurements, combined with the gravitational-wave detection, provide confirmation for Einstein’s general theory of relativity, which predicts that gravitational waves should travel at the speed of light. The observations also reveal signatures of recently synthesized material, including gold and platinum, solving a decades-long mystery of where about half of all elements heavier than iron are produced. The research was published today in Physical Review Letters and in an open-access paper in The Astrophysical Journal Letters. About 130 million years ago: Two neutron stars are in their final moments of orbiting each other, separated only by about 300 kilometers (200 miles) and gathering speed while closing the distance between them. As the stars spiral faster and closer together, they stretch and distort the surrounding space-time, giving off energy in the form of powerful gravitational waves, before smashing into each other. At the moment of collision, the bulk of the two neutron stars merge into one ultradense object, emitting a “fireball” of gamma rays. 1.7 seconds later: NASA’s Fermi Gamma-ray Space Telescope and the European INTEGRAL satellite detect a gamma-ray burst (GRB) lasting nearly 2 seconds from the same general direction of sky. Both the Fermi and LIGO teams quickly alert astronomers around the world to search for an afterglow. Hours later: Armed with these precise coordinates, a handful of observatories around the world starts searching the region of the sky where the signal was thought to originate. A new point of light, resembling a new star, is found by optical telescopes first. Known as a “kilonova,” it’s a phenomenon by which the material that is left over from the neutron star collision, which glows with light, is blown out of the immediate region and far out into space. Days and weeks following: About 70 observatories on the ground and in space observe the event at various longer wavelengths (starting at gamma and then X-ray, ultraviolet, optical, infrared, and ending up at radio wave frequencies). In the weeks and months ahead: Telescopes around the world will continue to observe the radio-wave afterglow of the neutron star merger and gather further evidence about various stages of the merger, its interaction with its surroundings, and the processes that produce the heaviest elements in the universe. B. P. Abbott et al. 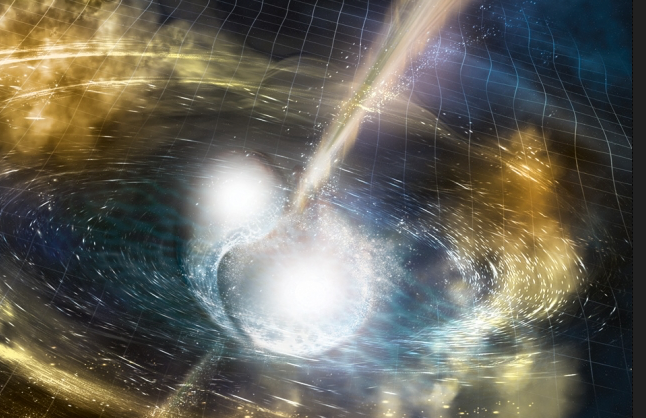 (LIGO Scientific Collaboration and Virgo Collaboration), “GW170817: Observation of Gravitational Waves from a Binary Neutron Star Inspiral,” Phys. Rev. Lett. 119, 161101 (2017).